bikes… The shifting buttons are placed both at the standard shifters place, but as well at the standard brakes place, which should be very useful when standing on the bike ! 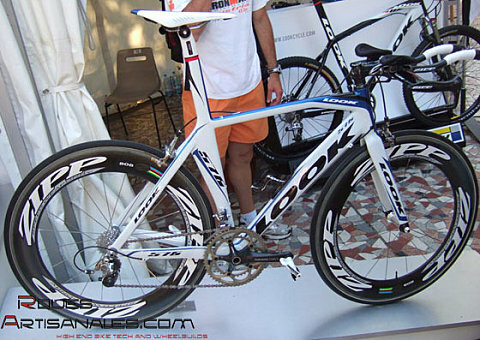 The first 2009 Look frames have been unveiled some days ago in Nice Ironman. to absorb the road vibrations through three elastomer of different stiffness. 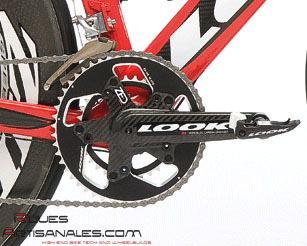 A new promising crankset sees the light of day, we will tell you more in the lines below. claims the drag coefficient is reduced of 10% from a 496, which was not the slowest bike either… However the stiffness will be down to a lower standard. reference in term of stiffness. This crankset is made out of a single piece of carbon and is designed to fit perfectly and easily the 596 triathlon frame. It seems like there are 10 chainring bolts instead of 4 or 5 for normal cranksets. The chainrings certainly will only be available at Look. through very aero tubes. The frame is about 1100g acording to the manufacturer. The 595 Pro Team will be used by the team Crédit Agricole during this Tour de France 2008. Agricole during the Tour de France. 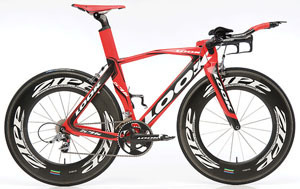 Finally the 496 remains the stiffest monobloc frame from Look. It will receive a newest red and black dress. 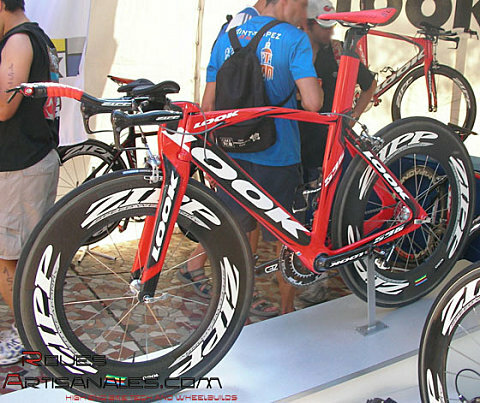 Retail price will be about 3000 euros for the frame set..
Every products should be available at the fall.